William Charles Anderson was the son of James and Elizabeth Anderson. William was born in Clabby, County Fermanagh, about 1897. The 1911 census records that his mother was a widow. 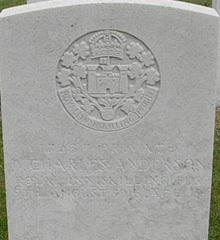 Charles Anderson was living in Fivemiletown when he enlisted in Tempo, Co. Fermanagh. Private William Charles Anderson was serving with the 1st Battalion of the Royal Inniskilling Fusiliers when he was killed in action near Ypres on 9th August 1916. Private Anderson was 19 years old.